WAKEFIELD, Mass., July 31, 2007 — The NFC Forum , a non-profit industry association that advances the use of near field communication (NFC) technology, today announced the publication of four tag type technical specifications. The specifications are available to the public for download at no charge from the NFC Forum Web site, www.nfc-forum.org/specs/ . NFC is a short-range, wireless connectivity technology that allows consumers to perform safe, contactless transactions, access digital content, and connect electronic devices with the simplicity of a single touch. Consumers with NFC-enabled mobile phones may, for example, leave their wallets at home and use their phones to conduct contactless financial transactions, or to gain electronic access to public transportation. Tags are integrated circuits that store data that can be read by NFC-enabled devices to support these applications. For example, a cinema goer with an NFC-enabled mobile phone may touch the phone to a movie poster containing an embedded NFC tag to view a preview of the movie. By standardizing the tag types and formats with the specifications announced today, the NFC Forum is promoting interoperability across the NFC market, enabling low-cost volume production, and clearing a path to a global, cost-effective mass market. More than one billion NFC-ready tags are already deployed worldwide for use in areas such as accessing public transportation, hotel rooms, and offices. Building on existing technology, the Forum’s tags are based on the International Organization for Standardization (ISO) 14443 Type A and B standards and Sony’s FeliCa. The four tag types are all based on existing contactless products and are available commercially. The NFC Forum has mandated that the four tag types be operable with NFC devices. This mandate is the backbone of interoperability between NFC tag providers and NFC device manufacturers to ensure a uniform user experience. The tag specifications are the most recent in a series of specifications being developed by the NFC Forum. The NFC Data Exchange Format (NDEF) specification and four Record Type Description (RTD) specifications were released in 2006. These specifications are also available for download at www.nfc-forum.org/specs/ . Type 1 tag is based on ISO14443A. Tags are read and re-write capable; users can configure the tag to become read-only. Memory availability is 96 bytes and expandable to 2 kbyte; communication speed is 106 kbit/s. Type 2 tag is based on ISO14443A. Tags are read and re-write capable; users can configure the tag to become read-only. Memory availability is 48 bytes and expandable to 2 kbyte; communication speed is 106 kbit/s. Type 3 tag is based on the Japanese Industrial Standard (JIS) X 6319-4, also known as FeliCa. Tags are pre-configured at manufacture to be either read and re-writable, or read-only. Memory availability is variable, theoretical memory limit is 1MByte per service; communication speed is 212 kbit/s or 424 kbit/s. Type 4 tag is fully compatible with ISO14443A and B standards. Tags are pre-configured at manufacture to be either read and re-writable, or read-only. Memory availability is variable, up to 32 KBytes per service; communication speed is up to 424 kbit/s. 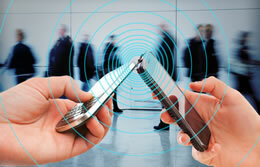 Near Field Communication (NFC) is a standards-based, short-range wireless connectivity technology that enables simple and safe two-way interactions among electronic devices. NFC technology allows consumers to perform contactless transactions, access digital content and connect devices with the simplicity of a single touch. Near Field Communication (NFC) technology provides global interoperability of contactless identification and interconnection technologies. NFC operates in the 13.56 MHz frequency range, over a typical distance of a few centimeters. The underlying layers of NFC technology are based on ISO, ECMA, and ETSI standards. NFC technology is supported by the world’s leading communication device manufacturers, semiconductor producers, network operators, IT and services companies, and financial services organizations. NFC is compatible with hundreds of millions of contactless cards and readers already deployed worldwide. The NFC Forum, www.nfc-forum.org , was launched as a non-profit industry association in 2004 by leading mobile communications, semiconductor and consumer electronics companies. The Forum’s mission is to advance the use of Near Field Communication technology by developing specifications, ensuring interoperability among devices and services, and educating the market about NFC technology. The Forum’s 110+ global member companies currently are developing specifications for a modular NFC device architecture, and protocols for interoperable data exchange and device-independent service delivery, device discovery, and device capability. The NFC Forum’s Sponsor members, which hold seats on the Board of Directors, include leading players in key industries around the world. The Sponsor members are: HP, MasterCard International, Microsoft Corp., NEC, Nokia, NXP Semiconductors, Panasonic, Renesas Technology, Samsung, Sony Corporation, and Visa International.